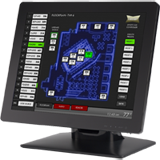 Turnkey Touch Screen AV Control Systems for Installers and Bar/Restaurant Owners! Don't let your customers miss one second of the game. Set any DirecTV or Cable Box to any channel on any TV in less than one second - all from a touch screen or mobile device! No more pointing remotes!  GET THE LATEST IN TOUCH SCREEN AUDIO AND VIDEO CONTROL TECHNOLOGY FOR YOUR BAR, CASINO, RESTAURANT, HOTEL, DEALERSHIP, RECREATION CENTER, BOWLING ALLEY OR NIGHTCLUB! While March Madness is now over, the MLB is in full swing. Don't let your guests miss a single second of any game due to a dated system with multiple IR remotes, dozens of DirecTV receivers and countless TVs. Why not upgrade your sports bar or restaurant AV control system to a state-of-the-art touch screen control system from Cinemar? Many new bar and restaurant owners remember to budget for DirecTV, TVs and projectors, but forget to think about how to control the entire system until after everything is installed. That's where Cinemar comes in. Our systems are suprisingly affordable and yet more feature-rich than the competition. In fact, our customers have told us we are sometimes two to five times cheaper than the closest bid! Cinemar has a devoted team of experts ready to assist you in designing your next touch screen audio/video control package for small or large sports bar, hotel, nightclub, bowling alley or restaurant. Give us a call if you are tired of your existing modulated solution. 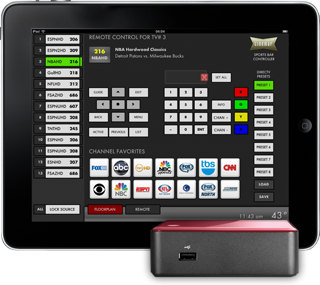 Our automated solutions are centered around a touch screen command center, smart phone or tablet that bartenders and managers can interact with to select which TV broadcasts any of the available sources such as HD satellites, karaoke, DirecTV and even gaming systems. Throw out your old RF modulation setup that requires staff to change the channel on the TV just to select a DirecTV receiver...that's too confusing as you already know. Our solutions select the DirecTV receiver for you. We've partnered with select manufacturers to deliver a completely out-of-the-box working solution so you can focus on your core business. 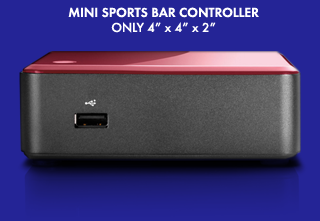 Optionally, you can control your entire sports bar from an iPad. In-wall docks are also available for your iPad. So if you're tired of using flakey remote controls and trying to manage changing channels on multiple stacked DirecTV receivers -- Cinemar has the solution for you. Our control system actually enables your staff to become more efficient and the end result is generating more money for your business. Keep your staff behind the bar rather than walking around to televisions and DirecTV receivers and fumbling remote controls. 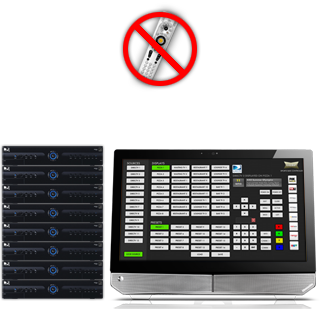 If your existing setup takes more than 5 seconds to select a TV and change the channel on it, then our system is for you. If you are the only employee who knows how to operate your existing system, then our system is definitely for you. 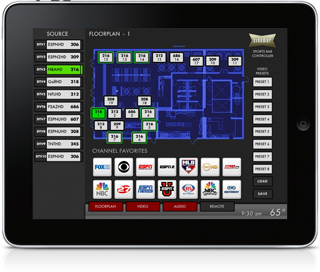 General managers and staff can also control everything right from their smart phone or iPad! Simply press LOCK SOURCE on the user interface to Lock in the selected source. Any subsequent TVs you press automatically switch to that source saving you countless clicks. 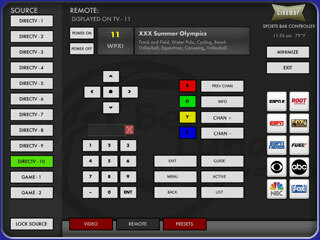 Our system shows you exactly what other displays are being shared by the same source/DirecTV STB. So when you change channels on your DirecTV, you'll know exactly what other displays will be affected. Jump to your favorite channels with a single click. Saves and Recalls the channels of all your DirecTV Set-Top Boxes. One click sets all your DirecTV Set-Top Boxes to the same channel instantly. 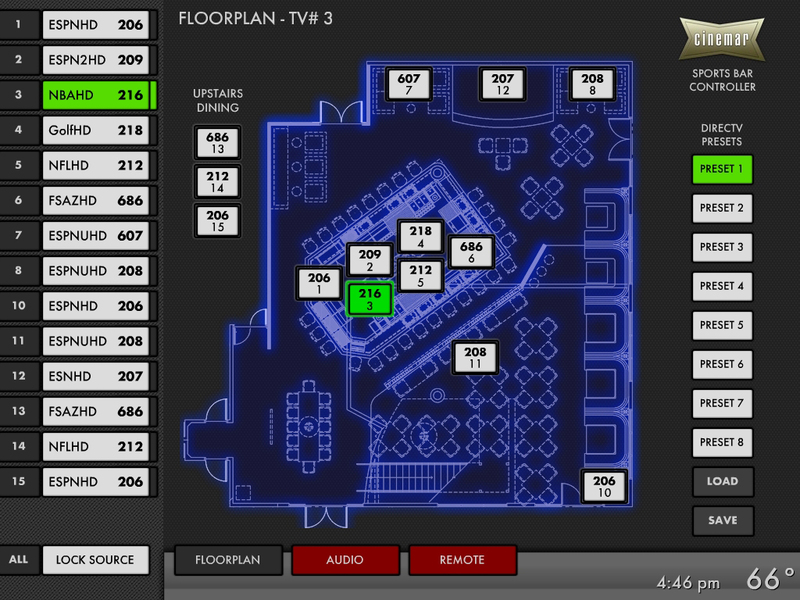 We'll integrate your digital floor plan into the system so staff can visually select the TV to control. Be sure to ask about our network controlled HD Blu Ray Players. They can be controlled from our touch screens too! Building or renovating a new sports bar? Be sure to budget for one of our control systems today! Get a quote right over the phone by calling 262-859-2666. Cinemar is looking for US installers interested in adding value to their current offerings. If you are already pre-wirining sports bars and restaurants, this is a great opportunity. We have experienced designers and programmers in-house that can create stunning user interfaces, integrate floor plans and completely program the system for you. Or if you are a dealer, we can work with you to deliver one of our turnkey systems to your customer. 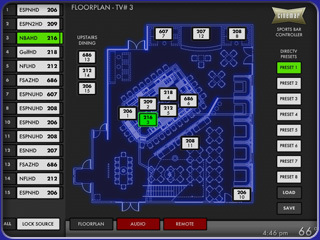 Whether you have 8 TVs or 88, Cinemar can design a control system perfect for you. Contact us at 262.859.2666 today to get started. Quotes are given right over the phone. Also, take a look at our case studies to see a variety of hardware options and customized systems we have designed. Distribute HD video and optional Digital Coax Audio, Stereo Analog Audio or IR over a single cat5 cable using our HDMI or Component Video Baluns. "Cinemar has proven to be successful in all of our venues. From the implementation process to the ongoing service they have exceeded our expectations. It's been a seamless experience for our entire team." "The ease at which we are able to pull up sports channels for any or all of our 24 TV's is great. Training the staff to use the system has been easy as well. Cinemar has been very professional and extremely helpful. Thank you Cinemar for providing a great product and service for an affordable price!" "While searching for a video/audio matrix system, for our busy golf course sports bar, we came across Cinemar, Inc. 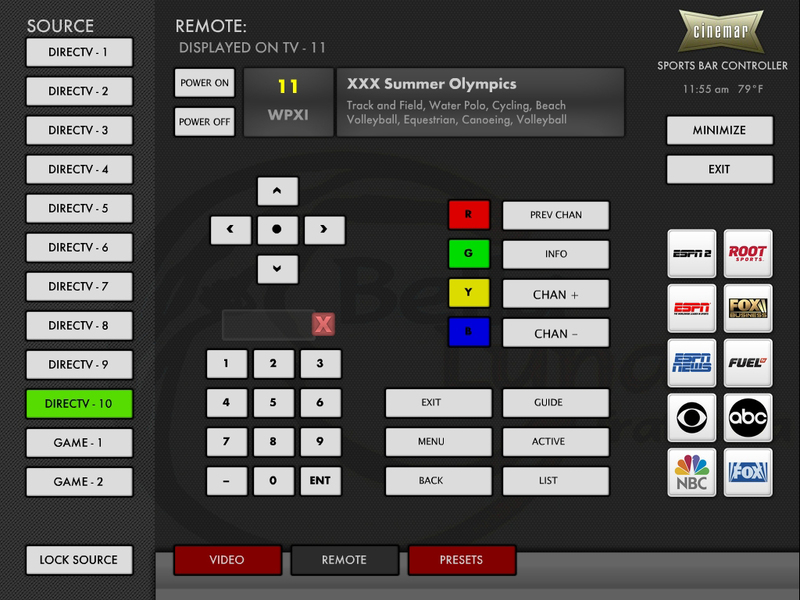 This software is perfect for our multiple television set up. Its clean, professional interface is a snap for the staff to use. Mario Cascio answered all of our questions prior to purchase and he didn’t disappear after install. He even made requested programming changes on a Friday afternoon before a holiday weekend. I really feel we made the right choice in Cinemar, Inc."
"The flexibility, ease of use, capabilities, and overall awesomeness of our TV system has allowed us to focus on entertaining our customers with the touch of a button. It also gives us the time to provide them the service they deserve." 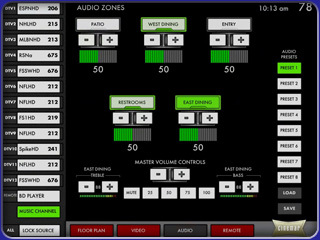 "We just love our Cinemar Control System and our AudioFetch system! The employees immensely appreciate being able to turn any television with simplicity and quickness, especially when we are busy. The system never falters and is pretty idiot proof for the not so tech savvy people. Cinemar also has excellent customer service and is so helpful to answer any questions." "We were quoted some ridiculous numbers by hardware companies that wanted to drag miles of HD cable or install a $35,000 24 channel booster device for HD. But that changed after I talked to Cinemar. Cinemar devised a system run from a single touch screen computer that polls each DirecTV receiver (21 total) wirelessly. The bartender can take change requests from customers or wait staff and can easily key in channel changes without disrupting the floor in any way. I have four full time bartenders who learned the system in a matter of fifteen minutes. Once the decision was made to go with Cinemar's solution, we were running smoothly within two weeks. And they brought it in at a very reasonable and affordable price. I would not hesitate to recommend Cinemar’s solution to anyone running a number of TVs using remotes or the old standard receiver booster solution." "System works fabulous. I want to add a review to give a sense of how great the customer service has been as well. Thanks Mario and the Cinemar team!" "We have loved the system so far, one year in. Reliable, cost effective, and the service from Cinemar has been exceptional. Cinemar has been a great partner to do business with." "Working with Mario from Cinemar was one of the absolute best business experiences I have ever had. He went out of his way (above and beyond) to come up with solutions that would make my implementation the most productive and found ways to save me some money along the way. I needed things very fast. Mario and the team at Cinemar delivered BIG TIME. When my gear arrived and I started to install I could not believe how easy it was to put things together (thanks to the diagrams and emailed instructions provided in advance). By far the best customer service experience I have ever had when dealing with technology. My video system is up and running perfectly. My customers love it, my staff love it......and I absolutely love it. If your ever in New York City, pop over to Donovan's Pub in Woodside Queens (57-24 Roosevelt Avenue, Woodside NY 11377) to check it out!" "Cinemar was a job saver. A local college watering hole just completed a remodel, three weeks before the school year began, which included an additional 20 flat panel displays and 8 high definition sources. After hiring a sorority of new help, fear of getting the right game to the right table at the right time set in. This is where Cinemar saved the day. Their touch screen system was able to route any source to any tv with the touch of a button. 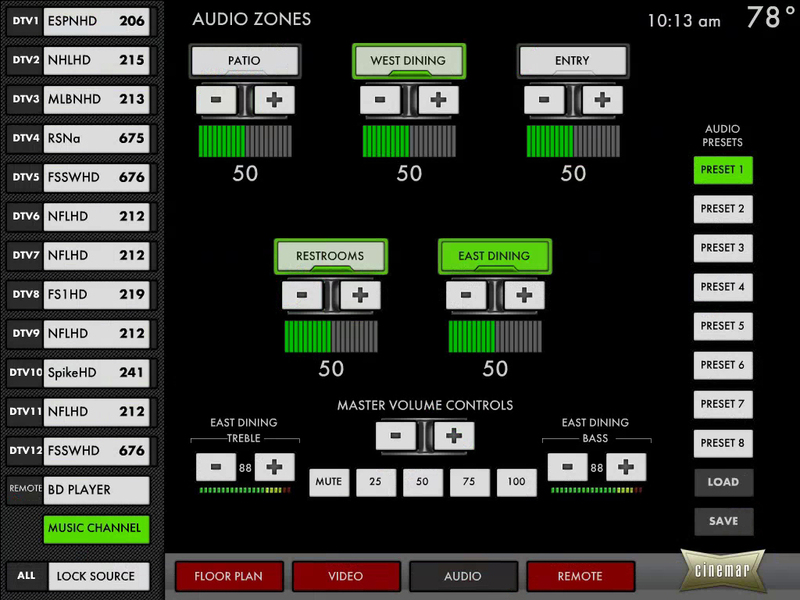 Right out of the box a true plug and play routing system and extremely intuitive to use. Thanks Cinemar." "Cinemar was a pleasure to work with. They were sensitive to our needs and designed a television/video control system perfect to the needs and budget of our Bar and Grill. Cinemar were always available to us through the whole process. I highly recommend this company." We offer FREE system design and consulting customized to your bar, restaurant, night club, bowling alley, arcade, rec center or casino. Want to see our system in action? We can schedule a live online demonstration using your web browser. Just give us a call! ADD A VIDEO WALL TO YOUR SPORTS BAR! BIGGER IS BETTER!